Outside my window... it is gray and cloudy and looks like it might rain. Hmmmm. I am enjoying this time where I don't have to turn the a/c on, but I do like my sunshine! I am thinking... about my beautiful daughter in law's birthday this week, and what I should get her for a present. She is the easiest of my family to buy for--she likes all pretty things and is not a high maintenance "only this kind of stuff will do" kind of girl. I am thankful for... all the work I got done last week so that when I walk through this house (in a few minutes) making my to do list for the week, it won't be quite so long! From the kitchen... something with the defrosted ground meat I have in my refrigerator. I was going to make crockpot spaghetti, but decided I shouldn't have to cook on Mother's Day. It's too much food for just PapaC and I, so I think I'll grill up turkeyburger patties so we can have them for suppers and lunches this week. I'm also going to make some soup, just because I love soup all year round and don't want to stop making it just 'cause it's spring. I'm am wearing... Black capris, pink t shirt, my good working sandals, tiny flip flop earrings (a gift from a friend!) and perfume. I am creating... the last 2 squares for Zoe's Christmas afghan, and the start of 100 (yes, you read that right!) 4 round granny squares for a crochet swap I am participating in. I am going... to Craft Circle at church tonight. Yay!! I'm also going to the library to straighten up what I owe to them so I can check out audio books. Think about those 100 squares! I am reading... Goodbye to a River by John Graves (which I didn't read much last week. I've got to get moving on it. This is a complete ditto from last week! I am hoping... that I can get my desk work done this week. If I could do that, I would be in a good place going forward. I am hearing... airplanes flying over the house. Lots of them. What's up with that. I am also hearing my washing machine going--it has a squeak that I can't get rid of so it sounds like I'm perpetually killing mice or something. Around the house... I need to go get the thing that you scratch up wallpaper with before you spray on glue dissolver. One thing I'd like to do this week is take down a wallpaper border that is oh so tightly stuck atop bedroom walls. It was cute when Zman was Zboy. Now, not so much! One of my favorite things... is Juicy Fruit gum. Just love it. A few plans for the rest of the week: Pay bills, personal and church. Craft Circle. Pick up quilt from lady who backed and quilted the top I took her--the last of my grandfather's and great grandmother's quilts DONE. Expensive? Yes. Worth every penny. Let's see. Clean and laundry. YARD WORK. I just don't want to do it the same day that all the professional yard work guys are here on the street working. Vanity, thy name is Terry. 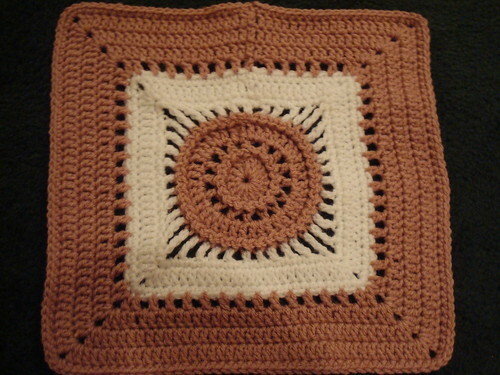 This is one of the May squares I did for my block of the month crochet along. The colors on the picture are terrible--they are dusty pink and white in real life. But the square itself is pretty! I had to settle up with the library last week. The DVDs get me every time. MUST SEE QUILT. This page contains a single entry by MamaT published on May 10, 2010 8:01 AM. From The Summa Mamas to You! was the previous entry in this blog. Monday Morning Music is the next entry in this blog.